AirDOC is based in Germany and produces a large range of high quality publications, decals and resin detail/conversion sets. 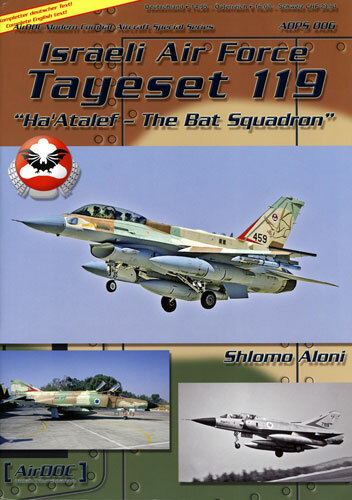 The subject of this review is ADPS 006 in their Modern Combat Aircraft Series and it covers the history of the Israeli Air Force’s 119 Squadron – the Bat Squadron. The book provides a history of the squadron from its formation in 1956 to present day. It is logically broken down by era and by the aircraft flown by the squadron during the era. A detailed action and operational history of each of these aircraft is within its respective chapter. As far as I am concerned, the best part of the book is the photographs, all 146 of them. 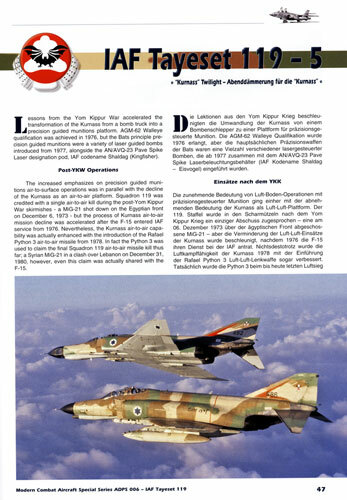 Photographic coverage of operational Israeli Air Force aircraft is sparse to say the least and what is available is generally pretty poor and grainy, the pages of this book however hold some excellent photos both historical and modern day. The book is soft back with thin card covers, A4 in size and comprises 64 Pages printed on high quality glossy paper. This is more of a “history of” type book than a modelling reference but it will appeal to both camps at the same time. Recommended to those with an interest in Israeli Air Force combat aircraft.